This post is an adaptation of the official Bocadillo tutorial. Hi everyone! Today's post is going to be a little special. Some of you may remember this post I wrote some months back: How I Built A Python Web Framework And Became An Open Source Maintainer. With all these good vibes in the air, I finally decided to go ahead and publish a thorough tutorial. Without further ado, here's the plot: we're going to try and build a chatbot server! 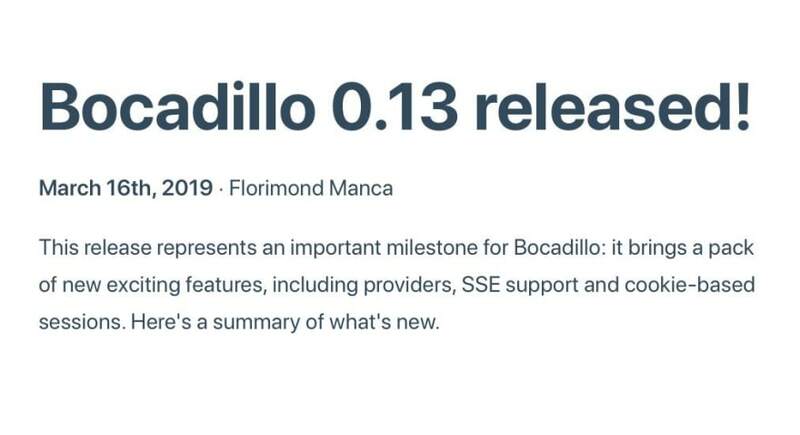 Bocadillo has many features built-in, so this is a great opportunity to go through some aspects of building web services with Bocadillo. Use WebSocket to handle multiple connections in real-time. Use providers to inject reusable resources into views. Test a Bocadillo application using pytest. Still wondering how we'll build something seemingly as complex as a chatbot? Well, you probably know that Python has a gigantic data science ecosystem. I would've bet actual money there would be a chatbot framework somewhere out there. Turns out — there was! After some research, I stumbled upon ChatterBot. It looks pretty solid and popular, so we'll use it to build Diego, a friendly conversational agent. Don't worry, this won't require any background in data science nor chatbot technology! Install Bocadillo and ChatterBot. We're using pipenv to install dependencies here, but you can also use plain ol' pip + virtualenv too. # Note: pytz is required by chatterbot. If you go to http://localhost:8000 and get a 404 Not Found response, you're all good! Enter Ctrl+C in your terminal to stop the server. We're now ready to get to the meat of it! The first thing we'll build is the WebSocket endpoint. If you're not familiar with WebSocket, don't worry — here's a 10-word summary: it allows a server and a client to exchange messages in a bidirectional way. It's good old sockets reinvented for the web. Due to their bidirectional nature, they're very suitable for the kind of application we're building here — some sort of conversation between a client and a server (i.e. our chatbot). If you're interested in learning more about WebSockets in Python, I strongly recommend this talk: A beginner's guide to WebSockets. Alright, so we won't plug the chatbot in yet. Instead, let's make the server send back any message it receives — a behavior also known as an "echo" endpoint. This defines a WebSocket endpoint which will be accessible at the ws://localhost:8000/conversation location. The async for message in ws: line iterates over messages received over the WebSocket. Lastly, await ws.send(message) sends the received message as-is back to the client. # See asyncio docs for the Python 3.6 equivalent to .run(). Run the server-side application with python app.py and, in a separate terminal, start the client.py script. You should be greeted with a > prompt. If so, start chatting! > Is there anyone here? Type Ctrl+C to exit the session and close the WebSocket connection. Now that we're able to make the server and a client communicate, how about we replace the echo implementation with an actual, intelligent and friendly chatbot? >>> from chatbot import diego  # Be patient — this may take a few seconds to load! Let's now plug Diego into the WebSocket endpoint: each time we receive a new message, we'll give it to Diego and send his response back. If you run the server/client setup from earlier, you can now see that Diego converses with us over the WebSocket! I am a chat bot. I am the original chat bot. Did you know that I am incapable of error? Clients are now able to chat with Diego over a WebSocket connection. That's great! Loading Diego is quite expensive: it takes about ten seconds on a regular laptop. Because of the import at the top of the script, we'd load Diego every time we import the app module. Not great! Diego is injected as a global dependency into the WebSocket endpoint: we can't swap it with another implementation (especially useful during tests), and it's not immediately clear that the endpoint depends on it at first sight. 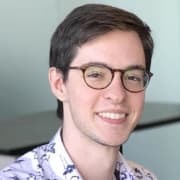 If you think about it, Diego is a resource — ideally, it should only be made available to the WebSocket endpoint at the time of processing a connection request. Providers are a unique feature of Bocadillo. They were inspired by pytest fixtures and offer an elegant, modular and flexible way to manage and inject resources into web views. Let's use them to fix the code, shall we? The code above declares a diego provider which we can now inject into the WebSocket view. All we have to do is declare it as a parameter to the view. async def converse(ws, diego):  # <-- 👋, Diego! Alright, ready to try things out? Run the client.py script, and start chatting! You shouldn't see any difference from before. In particular, Diego responds just as fast. There you go! Beautiful, modular and flexible dependency injection with Bocadillo providers. Let's go one step further. True, we have quite elegantly implemented conversation with a chatbot over WebSocket. Now, how about we keep track of how many clients are currently talking to the chatbot? If you were wondering — yes, we can implement this with providers too! Now, let's add another provider which returns a context manager that takes care of registering the ws connection to the set of clients. FYI, this is an example of a factory provider, but you don't really need to understand the whole code at this point. That's it! While the client is chatting with Diego, it will be present in the set of clients. How about we do something with this information? As a final feature, let's step aside from WebSocket for a moment and go back to the good old HTTP protocol. We'll create a simple REST endpoint to view the number of currently connected clients. Again, if you've ever worked with Flask or Falcon, this code shouldn't come as a surprise. All we do here is send the number of clients (obtained from the clients provider) in a JSON response. Go ahead! Run python app.py and run a few python client.py instances. Check out how many clients are connected by opening http://localhost:8000/client-count in a web browser. Press Ctrl+C for one of the clients, and see the client count go down! We're mostly done in terms of the features we wanted to cover together. I've got some ideas you can explore as exercises, of course, but before getting to that let's write some tests. One of Bocadillo's design principles is to make it easy to write high-quality applications. As such, Bocadillo has all the tools built-in to write tests for this chatbot server. Now, let's setup our testing environment. We'll write a pytest fixture that sets up a test client. The test client exposes a Requests-like API as well as helpers to test WebSocket endpoints. Besides, we don't actually need to test the chatbot here, so we'll override the diego provider with an "echo" mock — this will have the nice side effect of greatly speeding up the tests. If you've made it so far — congratulations! You've just built a chatbot server powered by WebSocket, ChatterBot and Bocadillo. Use providers to decouple resources and their consumers. Test WebSocket and HTTP endpoints. The complete code for this tutorial is available on the Bocadillo repo on GitHub: get the code! All in all, the server and providerconf.py only add up to about 60 lines of code — pretty good bang for the buck! Obviously, we've only scratched the surface of what you can do with Bocadillo. The goal of this tutorial was to take you through the steps of building a Minimum Meaningful Application. You can iterate upon this chatbot server we've built together very easily. I'd be interested to see what you come up with! Train Diego to answers questions like "How many people are you talking to currently?" Currently, all clients talk to the same instance of Diego. Yet, it would be nice if each client had their own Diego to ensure a bespoke conversation. You may want to investigate cookie-based sessions and factory providers to implement this behavior. I hope you enjoyed this tutorial! If you'd like to support the project, be sure to star the repo. If you don't want to miss on new releases and announcements, feel free to follow @bocadillopy on Twitter! Hi Florimond! Great update on your project and tutorial. Bocadillo is quite simple, great job! In providerconf.py, remove "async" from line 29. In app.py, remove "async" from line 9. I can't tell you how happy I am to find your project. This is EXACTLY what I've been looking for! Why is async and python so unloved?